WHAT DOES IT TAKE to reduce three grown men with over 80 years of wine trade and tasting experience to giggling like a trio of tippling teenagers? 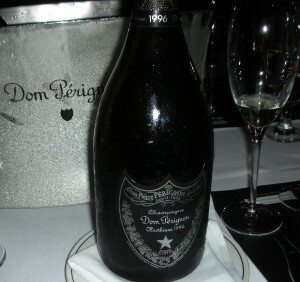 Maybe it takes what may be the best bottle of Champagne I have ever tasted – Dom Perignon Oenotheque 1996. Back on October 5th of 2012, Wayne Hannah of Glazer’s, Robert Gilroy of LVMH, and I were tasting in my office when Robert opened and poured a bottle of Dom Perignon Oenotheque 1996 into Riedel Vinum Grand Cru Riesling glasses (which are both my standard tasting glass and my favorite for drinking vinous Chamapgne). I picked up the glass and tasted it and … nothing. The fizzy gold-leaning-toward-bronze liquid in the glass showed me nothing. The nose was completely closed and the first taste was just wet. I looked over at Robert who had just tasted the wine and he had a horrified look on his face. Rather than saying anything, I gently swirled the wine in my glass (yes, you can swirl Champagne). When I tasted it again, it was better. Actually it was excellent and it quickly moved to outstanding. After maybe five minutes, all three of us were giddy over how good it was. And we stayed giddy as we kept coming back to it as we tasted several other wines. Is this the best Champagne I’ve ever tasted? I can’t remember another that was better. This is a Champagne worthy of decanting. Tech Note: 12.5% Alcohol. The blend is unnpublished but the producer notes that typically, there is “a commensurate amount of Pinot Noir and Chardonnay in any given year of Dom Perignon.” Whatever the blend, the cuvee was aged 15 years on the yeasts before disgorment and finishing. Sensory Note: pale-gold-straw in color, and with sparkling; dry, medium bodied with fresh acidity and minimal phenolics. Pale gold color. Starts with nothing and then … WOW!. Changes in the mouth with richness and flavor added to richness. The color actually lightened in the glass after it was poured. Has the minerality of a grand cru chablis along with lemony citrus and darker red fruit. The complex and complete flavors come in waves. Super length with the toasty Champagne character completely integrated. Stunning. This is Champagne as WINE and really outstanding wine at that. Drink this from wine glasses rather than flutes or tulips. Consider decanting it. BS: 100.